Ariel Sharon's doctors on Wednesday hoped to remove the prime minister from all remaining sedatives after he moved his left hand for the first time, but hospital officials cautioned against being overly optimistic about his chances for recovery from a massive stroke. Although doctors said Sharon was no longer in immediate danger, they said it would be days before they could determine the full extent of the damage he suffered from a brain hemorrhage. "I think compared with recent days ... there are significant changes in the prime minister's condition, but we still have a long way to go, and we have to be patient," Dr. Yoram Weiss, one of Sharon's anesthesiologists, said Tuesday. On Wednesday, a week after he suffered the stroke, doctors expected to stop giving him the last of the sedatives that have kept him in a coma — a key step toward determining the extent of the damage. Israel Radio said it would take about 36 hours for the drugs to exit his system completely. But Dr. Yair Birenboim, a senior official at Hadassah's Ein Kerem Hospital where Sharon is hospitalized, said the process could be reversed at any point. "You can stop them for a few hours, get an idea of what is happening and of course immediately retransmit them," he told Army Radio. "These are routine things that happen with patients." Doctors began decreasing the sedatives Monday, and Sharon started breathing on his own and moved his right arm and leg slightly in response to pain stimulation. "I pinched Prime Minister Ariel Sharon on his right hand, and he responded with a clear and significant movement in an attempt to move his hand away from the source of the pain," Sharon's chief surgeon, Dr. Felix Umansky, was quoted as saying in the Yediot Ahronot daily Wednesday. On Tuesday, he increased his movement on the right side and also moved his left arm in response to stimulation, said Dr. Shlomo Mor-Yosef, the director of Hadassah Hospital. Movement on Sharon's left side could be significant because that part of the body is controlled by the right side of the brain, where Sharon's stroke occurred. Doctors tried a number of ways to provoke a response from Sharon. His sons spoke to him, resulting in a slight increase in his blood pressure. And CBS News correspondent Robert Berger reports Sharon's favorite dish, savory lamb shawarma sliced off a skewer, was brought into his hospital room, in the hopes his legendary appetite would help bring him out of the coma. Sharon remained in critical but stable condition and had a decent chance of surviving, Weiss said. "More metaphorically speaking, we have backed off five yards from the edge of the cliff," he said. A final assessment would have to wait until the sedatives completely wear off, said Weiss. Then a determination would have to be made about whether Sharon can one day return to his post or a replacement must be named. Israelis were stunned at the illness of their 77-year-old leader and have intensely followed updates on his condition. Some made pilgrimages to the hospital, gathering outside to pray, hanging up posters of support and offering letters of well wishes, many written by young children. 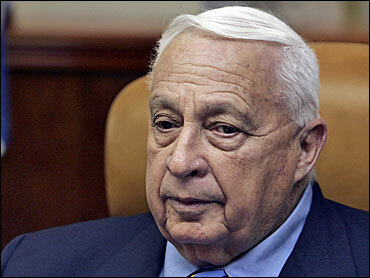 Israeli police said Tuesday that crime in the country had fallen 50 percent since Sharon's stroke. "It's hard to explain, but since the prime minister became ill there seems to have been a change in people's behavior patterns, their way of thinking," police spokesman Mickey Rosenfeld said. Since Sharon's stroke, acting Prime Minister Ehud Olmert has worked hard to portray an aura of stability. His first major test is resolving a dispute over whether to allow Palestinians to vote in the contested city of Jerusalem during Jan. 25 Palestinian parliamentary elections, an issue that threatened to derail the balloting. Olmert's office said the Cabinet will vote during its weekly meeting Sunday on whether to let Arab residents of Jerusalem cast absentee ballots in post offices — a compromise used in previous elections — provided no candidates from the militant Hamas group were on the ballot. Israel refuses to allow regular elections in Jerusalem, which both sides claim as their capital, out of fears it would weaken its claim to the city. Sharon's departure from the political scene has not effected the popularity of his new party, reports Berger. His centrist Kadima party is still expected to win the March 28 elections by a landslide, according to two new polls. With acting Prime Minister Ehud Olmert as its leader, Kadima would win 44 seats in the 120 member parliament. The hawkish Likud party led by former Prime Minister Benjamin Netanyahu would win just 14 seats. Sharon suffered an initial, minor stroke Dec. 18, which doctors said was caused when a blood clot escaped through a small hole in his heart. Doctors prescribed Sharon blood thinners ahead of a planned procedure to close the hole. Outside experts said the blood thinners could have worsened Sharon's brain hemorrhage. Doctors discovered after Sharon's initial stroke that he suffered from cerebral amyloid angiopathy, a disease that can cause brain bleeding, particularly in the elderly, Mor-Yosef said Tuesday. The revelation raised questions about doctors' decision to prescribe blood thinners. Birenboim defended the treatment in Wednesday's radio interview. The blood thinners were prescribed based on a "consensus of experts," Birenboim said, saying the group carefully weighed the pros and cons of how to treat the prime minister after his first stroke. "Everyone can be intelligent in hindsight ... but what if we had not given the prime minister the blood-thinning medication and he had suffered another clot? What would have been said then?" Birenboim asked. "This is part of the art of medicine," he said. "We have to consider things from here and there and decrease the damage as much as possible."